If you grew up eating sweet candies like peanut brittle, you like many others ate a lot of corn syrup and artificial ingredients. Today we know there are reasons to eat cleaner food -- food with fewer unhealthy additives and preservatives. For health, energy, and general wellbeing, research backs food that's more real -- fewer chemicals and less processing before it reaches your plate. So what about candy? For many, candy no longer has a place in their diet for the reasons above. But what if there was a cleaner candy without all of the ingredients we are learning to steer clear of for better health. Thankfully Bakefully Yours from Herndon, Virginia has developed a cleaner candy to satisfy sweet cravings. 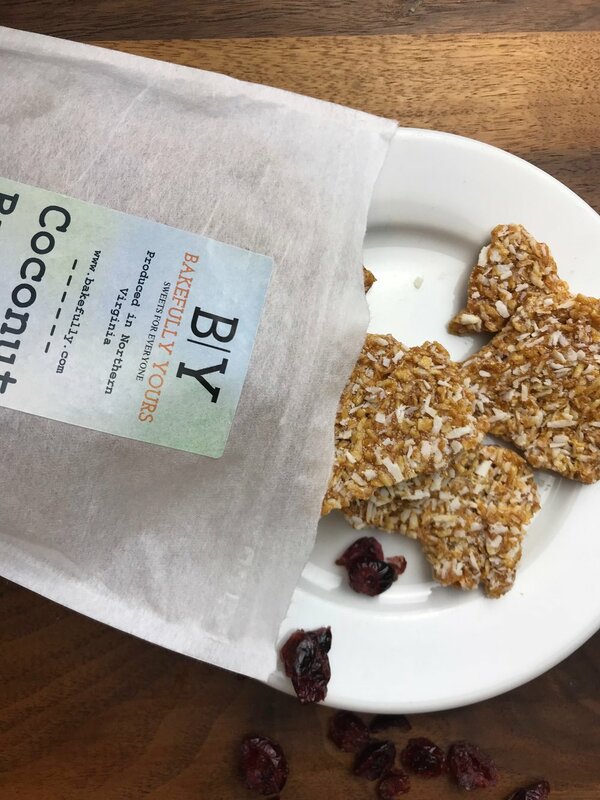 Coconut Brittle is everything you might have loved about peanut brittle, but made with only three organic ingredients: coconut, sugar and salt. They've managed to create a perfectly butter taste without the butter with sweetness without the corn syrup. With just the right amount of crunch and texture, Sarah Seligman's brilliant brittle also comes in perfectly-sized pieces. The Coconut Brittle is an exciting new confection to enjoy without the junk. It's dairy free, wheat free, soy free, egg free and amazing. We have a few candy lovers here in our office. The Bakefully Yours Coconut Brittle was a welcome addition to the snack room. A really nice factor about the product: the bag comes full. You pay $9.99 for a 7 oz bag and you're getting a lot of brittle. The packaging is beautiful too. This is a great gift for anyone or treat to serve when you're hosting a party. For lucky Herndon, Virginia locals, Bakefully Yours makes a few more treats for allergy sensitive diets. You'll want to download the Treatmo iOS App to checkout their local products for pick up and see when and where you can find them around town. Grab a bag or two of brittle from Treatmo app and toss your guilt out the window. Enjoy with abandon. Get the app to shop and gift from the Bakefully Yours mobile store.